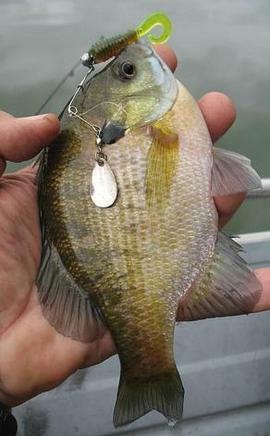 Fishing Forum : Freshwater Fishing Forum: Crappie & Panfish: Beetle Spin - anyone use them? Beetle Spin - anyone use them? For the heck of it I decided to give one a try and the results were great! Hadn't used that rig for 20 years since I caught smallmouth on it in my local river but decided to use it with light jigs and small plastics. Here's one I made using wire, a #2 Colorado blade & swivel. Many, many grub designs can be used and I stay with rigging then on 1/24 and 1/16 oz jigheads. TubeDude has a similar design he uses on some of his lures, can't remember what he calls them exactly but I think he calls them a roadrunner jig. I'll have to look around later today and see if I can find one but I've caught fish on them but it all depends on the when you use they, they don't seem to work all the time but I guess that's how all lure are. Hard to find that one lure that works all the time . Looks like your design is working well for you. I started using Crappie Magnet grubs this year and they seem to really produce. So far they have worked in cold water (49 degrees). Hard to believe they wouldn't work in warm. Nice thing is the number of lures that work under the blade. I truly have found soft plastic designs that work a great majority of the time that find fish and then catch them in water 10' of less. Key is using light jig heads, braid, a light action rod and slow retrieve. The Beetle Spin blade idea seems to be another that complements those designs. I guess I need to give them more of a try, the top lure in this pic is one that TubeDude designed, the bottom one is one that I bought locally and just added a jig that I've had some good success with, maybe adding the blade will increase my success. The second pic is some fish I caught using the bottom jig in the first pic. Why are they not allowing you to fish that lake again? I'm not familiar with the original Beetle Spin design the one in that pic was from Lindy. Here is pic of the package I got it from. Brown's Pond is part of the Newburgh, NY reservoir system and even though in the suburbs, controlled by the city. No one knows why it was closed it to the public though bad management in that town is thought the usual suspect. Now the system (three lakes connected by the same stream) has been found to be polluted upstream which began 40 years ago when the U.S. Air Force buried toxic waste in hundreds of barrels that broke down in the ground. The water is unsafe to drink and I gather maybe so are the fish to eat. Too bad - amazing fish quality!!! Never had a bad day! I guess that makes sense, if the water is polluted upstream, it is likely polluted downstream as well, could be the city just doesn't want to take the chance of people getting sick from eating the fish. Funny though, you would think that is something they would want to tell people about. Years ago they set up those Super funds to deal with sites like that, when they found buried toxic waste, sounds like they missed this one, too bad. perfluorooctane sulfonate, or PFOS. The chemical is linked with a number of health problems, including kidney and testicular cancers, ulcerative colitis and high cholesterol. Well that is strange, I wonder why it was open to fishing if the state declared it a Superfund site. Have they already done the cleanup and thought it was good to go or was it a misstep to opened it before the site was cleaned up. The city of Newburgh closed the two connected lakes to fishing - the largest lake about 15 years ago and the smaller one 5 years ago. The city manager knew nothing of the pollution either year and it remains a question why he would close lakes that were bringing in angler money to rent boats. Privately owned boats were not allowed to prevent cross contamination from other lakes. It's almost comical when you think what was eventually discovered. What I can't understand is why the drinking water sources were not routinely tested for contamination. Thousands drank that water for decades and who knows how many have been affected like in other parts of the nation finally coming to light. Yea, that is a very scary situation, a lot of times when these thing happen, it takes decades before someone starts to have problems from contamination like that, by then, the damage is done to your liver and other organs . I was first introduced to beetle spins in the late 1970s. I fell in love with them after adding them to the tubes and twisters I used for bass. The fish loved them too. I have been tieing flies, making jigs and other lures for several decades. At some point that included learning to work with wire...to make spinners and other lures. One of the things I developed was modifying some of my jig molds to accept a piece of wire...to which I could later add blades and beads. Since then, I always have some form of homemade "beetle spin" or other spinner-enhanced lures on almost every trip upon the waters. Here are some pics. 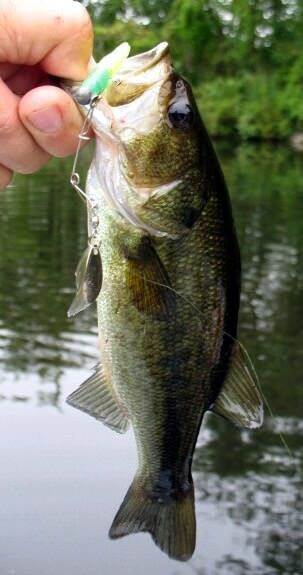 You will notice that some of the mini-spinner baits have been left without hooks. That allows you to use a split ring to add single or treble hooks...or dressed flies, etc. And in one picture you can see that I sometimes build the finished product with small tube jigs. I could not begin to count the number of fish...or species...that I have convinced to accept my spinner-enhanced goodies. They do work. 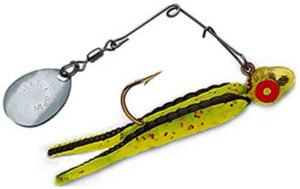 Both the Beetle Spin and Roadrunner show up regularly on All Time Best Lures lists. The Roadrunner has a horse-head jig head and the spinner runs underneath. Never used either before but that's about to change. Anybody know how they work under ice? I have been making and using "pony jigs" (trademark name "Roadrunners") for at least 30 years. I can make anything from 1/48 oz. to 2 oz. They are ideal for vertical presentations...like ice fishing. The little blade spins on both the lift and drop. Beetle spins will work but they are a much larger profile (not as good for ice fishing) and are designed more for cast and retrieve. I have several pony jig molds. Some of them put out heads with barbs...to attach plastics. Others are plain...for dressing with hair, feathers or synthetic fibers. I make "PBJs" with them too...painted body jigs. Those are the hot lures for whitefish at Bear Lake. And I can make them with glow too. Can't think of any species I have ever fished for that did not like those little funny looking jigs with a blade underneath. Just goes to show you - you are never locked in to using any lure design when it comes to fish of any species. Who knew I would be catching catfish up to 7 lbs on small lures! What's more is the nonsense wisdom of matching the hatch. I can put any of a variety of plastic lures in many colors on the beetle spin frame and catch just as many fish.